The final step is the clean up. The ring is first buffed on a buffing wheel, front, back, and on all sides. Finally, it is sent for inspection and bagging. 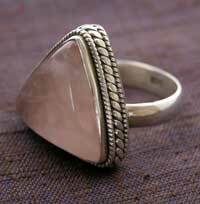 In all, a talented silversmith can do about one ring an hour. This ring would probably retail for around $30, and wholesale for about $8. This ring is shown on our site under the rings by weight assortment. It's amazing to think that there are hundreds of designs and no two are exactly alike!